Blessed are those who have not seen and yet have believed (Jn. 20: 29) our resurrected Lord Jesus Christ said to Saint Thomas and his fellow Apostles. These words should be of great comfort to us as to all generations who have come afterwards and are still to come. For they were, of course, directed to all those who would not witness first-hand His victory over death. Thus this lack of visual proof would require something much greater from those to follow to be partakers of the bountiful grace promised by the Lord. Through the teachings of the Holy Church, the salvific words of our Lord Jesus Christ are sown into our hearts. As the Lord tells us, the ground, upon which the seeds of eternal life fall, must be made ready. This begins of course with the confession from the Holy Apostle Peter that Jesus Christ is the Son of God come into the world. And he who believes in Him shall not perish but have everlasting life. And this promise of immortality is confirmed with His glorious Resurrection. For if we believe and confess truly that our Lord Jesus Christ is the risen Son of God then we, as members of His Body, are risen with Him. As such, our belief in the Resurrection must be steadfast in order to truly benefit from the unfathomable gift God has given us. For He has conquered death once and for all—it holds power over us no longer. So with the firm conviction in His victory, what is left to frighten us? True, it is wise to fear our Lord, in the sense of having a healthy respect for Him as our Creator. But what cause do we have to be fearful of what will happen later this year or even tomorrow? If we fully trust the teachings of the One Holy, Catholic and Apostolic Church, handed down by our Lord through the Holy Apostles and exemplified by the holy men and women that followed, our faith in Him and His ineffable mercy should then be unwavering. 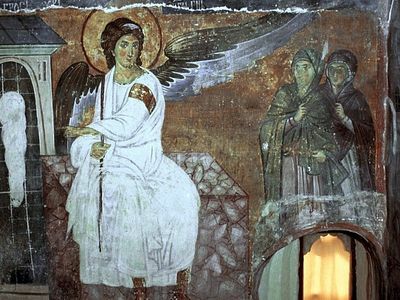 We must not allow the wind and waves of this troubled world to cause us to despair and sink nor be lulled into a spiritual slumber, but instead be ever filled with joy of His Pascha. And to fully rejoice in this victory over death, we must come to the realization that the Resurrection is a victory of love – God’s love for us and all His creation. Our Lord greatly humbled Himself to take on our corrupted nature and live a simple life in all its aspects. As the blameless Lamb He sacrificed Himself on the Cross, and as the Chief Shepherd opened the gates of Paradise for all those to be counted worthy of His sheepfold. This is love is commanded of us as well if we wish to truly be one with our Lord and His salvific gift. We see this in the words of our Savior: For no greater love does a man have than he lay down his life for his friends. And if we lose our lives for His sake and the Gospel’s sake, He promises the salvation of our souls. Let us take this time then to reflect with great joy upon what the Lord offers with these most comforting words in the Gospel of Saint John the Theologian. We as Orthodox Christians hope in God’s mercy, having put on our Lord Jesus Christ through Baptism and received the Seal of the Holy Spirit through Chrismation. We are able to then reconcile ourselves to God through Confession and again be united to Him in partaking of the Holy Mysteries. Truly there are no greater blessings for those who trust in the witness of the Word of God Himself. 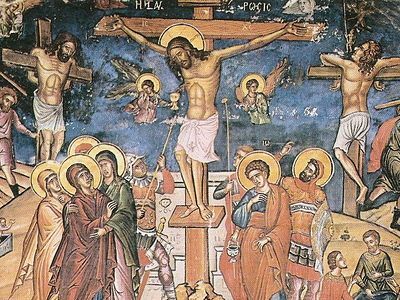 Having labored long in fasting and prayer during the Fast in preparation for our Lord’s Pascha, let us now go forth to all with that fervent joy in our hearts of His victory over death. May others see our steadfast belief and faith that He Who Is has taken away our fear of all that the spirit of this world will attempt to throw our way and cause us to stumble as we walk the path to the Heavenly Kingdom. And may that glorious light of our victorious Lord Jesus Christ shine brightly in us and His love for all mankind ever fill our hearts, so that those around us may come to know that truly He is Risen and together we all may be counted worthy to be blessed. From Parish Life, a monthly publication of the Russian Orthodox Cathedral of St. John the Baptist, May 2016. O my brethren, let us also cease to look for the living among the dead. If there are some of us who are still seeking Christ among the dead, let them desist from this soul-destroying effort. Even more than that... We are the generation who has seen (all the signs and wonder of the antichrist) and YET have believed (in Jesus Christ, the incarnated Son of God). In the West, man is educated by the devil since the cradle and until the grave by now, Christ is forbidden in schools and banished from the public discourse. Chesterton had it right: we are those who have seen and yet have believed. But our generation has seen things that Chesterton could not even imagine, yet we are here confessing: CHRIST IS RISEN! And there's nothing this world and its prince can do!